Something in the Air - the original French title was Apres Mai -isn't based on a book as far as I can tell but I couldn't resist posting the film's trailer for the Dreaming of France meme over at An Accidental Blog. The trailer looks - and sounds - fantastique! It takes place in Paris during the tumultuous late 60's; Apres Mai (After May) refers specifically to May of 68 - an especially dark period. The film written and directed by the accomplished Olivier Assayas (Summer Hours, Carlos) and better known to me due to my scandalously scant knowledge of contemporary french film, the "Quartier des Enfants Rougessegment" segment on Paris Je t'aime. The script won best screenplay at the Venice Film Festival last year; but what attracts me about what I see in the trailer - someone who lived through the 60's (are you sick of boomers like me lording our exciting times over you?) - is the authenticity, the rough feel of it. It's almost as if it had been shot then, back in those fast and furious times. Take a look at the trailer; see what you think. 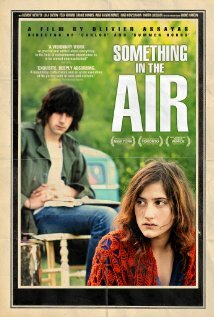 Something in the Air came out in France last November; it's currently playing here in L.A.; perhaps it's at an indie theater near you? I've not heard of this one at all (but that's not unusual)- it looks really interesting, thanks for introducing us Sim. I have only recently realized how many movies are made by the French. When I was there there was a new one they were promoting Hotel Normandy that looked interesting.